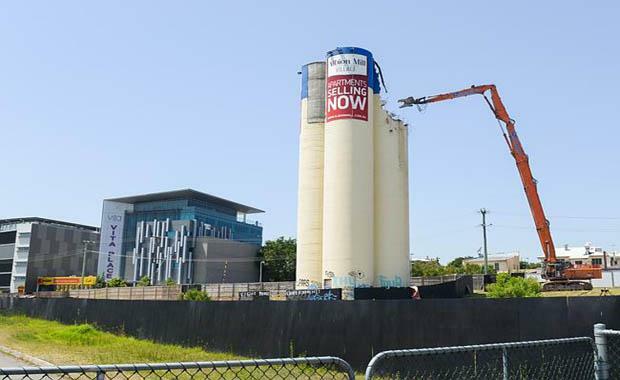 Yesterday Brisbane’s Albion Mill flour silos were demolished to make way for Aveo's $330 million development Albion Mill Village. The Village will include a 14-story, 140 apparent building and is expected to take 19 months to build. The Albion Mill operated until 2004 and just last year the old mill was gutted by a deliberately lit fire, leaving just the flour silos intact. Aveo executive general manager of development Gary Kordic told Brisbane Times that unlike the mill building, the silos were never going to feature in the company's plans for the site. "Even when we were keeping the mill itself, we were never keeping the silos," he said. "The silos are actually quite recent – I couldn't tell you an exact date, but I'd say '50s or ‘60s." Mr Kordic said the loss of the mill required a rethink of the design of the site, which was still before Brisbane City Council. "After we lost the mill, well you couldn't really build the old concept and not have the mill there," he said. "The site itself didn't have any real balance, so we had to go and revisit it." Mr Kordic said the mill would have been the centrepiece of Aveo's Albion Mill Village development. "It would have been fantastic," he said. "If you pay enough homage to the history of a site and pay enough attention to that history, it gives you a total point of difference that you can't really get with a new building. "It makes it a nice public area and people appreciate it, they talk about it, and they're aware of it when they're using it. The Albion Mill was built by Scottish pioneers the, Gillespie brothers in 1931. It provided employment to many locals throughout The Great Depression.